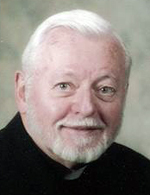 Father David A. Doyne, 86, pastor emeritus of Holy Martyrs Parish in Oreland, died Jan. 9. Born in Philadelphia the son of the late Edward T. and Cecelia C. (Kline) Doyne, he attended Most Precious Blood of Our Lord School in North Philadelphia and Roman Catholic High School before entering St. Charles Borromeo Seminary. He was ordained May 10, 1956 at Immaculate Conception Church in Germantown, Philadelphia, by Archbishop John F. O’Hara and his first assignment was as parochial vicar at St. Mary Parish, St. Clair. He also served at St. Bernard, Easton; St. Helena, Center Square and Resurrection of Our Lord, Chester. He also served on the faculty of St. Pius X High School, a chaplain at St. Francis Country House, (Now St. Francis Center for Rehabilitation and Healthcare), Darby, and rector of Villa St. Joseph, Darby. Father Doyne was named pastor of St. Ann Parish, Phoenixville, in 1989 and pastor of Holy Martyrs in 1996, where he served until 1998 when he was named pastor emeritus. He was also a senior priest at St. Stanislaus, Lansdale. Father Leo Oswald knew Father Doyne for years, first at Resurrection Parish and again at St. Ann. In her parish work she dealt with bereaved families, and Father Doyne was very helpful in this. Yet his time at Holy Martyrs was relatively short. How will people best remember him? “They will remember him with his dog, he loved that dog,” Duncheskie said. Father Joseph Shenosky got to know Father Doyne while he was a senior priest at St. Stanislaus. He also considered him a renaissance man, because his diverse interests and general knowledge of culture, the arts and literature. Father Doyne’s funeral Mass was celebrated Jan. 13 at St. Francis Center for Rehabilitation and Healthcare by Bishop John J. McIntyre. Concelebrants included Msgrs. William A. Dombrow and Daniel J. Sullivan and Father Shenosky, who was the homilist. Father Doyne is survived by nieces and nephews. Dear Uncle Dave, Franny and I miss you more than words can express. However, it gives us peace to know that you are with your heavenly father, to which you devoted your entire life serving in his name. We love you, please send us your love.